This is the 9th post in a series about Christian Baseball players who are outspoken about their faith, and are using their position of fame and spotlight to tell others about God, and the difference He has made in their life. Jeff Francoeur has a story to tell. The outfielder for the Kansas City Royals has been a highly touted player, since being drafted in the first round of the 2002 draft by the Atlanta Braves. He was quickly making his way through the minor leagues when his career nearly came to a sudden and painful end. On July 7, 2004, Francoeur was struck in the face by a pitch. Bones were broken, metal plates were surgically inserted, and vision was blurred. There was question as to whether he would see clearly with his right eye again. A devastating injury like this could bring hopelessness to those who don’t have a coping strategy. But Francoeur leaned on his faith in God to help him deal with the injury. It was a faith that he began taking seriously as a sophomore in high school when he attended a Fellowship of Christian Athletes camp in South Carolina. There, his small group leader was NFL tight end Ben Watson. Francoeur loved sports, he lived and breathed them, and here he saw a professional athlete whose life was in sports, but his identity was not found in sport – it was found in a relationship with Jesus. Francoeur chose to begin a relationship with Jesus at that camp, and with that perspective in place, he dealt with this injury knowing that ultimately, God is in control and had a plan to use him and this part of his story to share about God’s love and goodness. You can read an article about Francoeur from the Dayton Times here. Amazingly, 1 year after the injury, he was called up to the major leagues and he has been there ever since. He is known as a decent hitter with some power and a laser arm. In fact his 86 outfield assists in the 5+ years that he has been in the majors are almost 20 more than then next closest over the same time frame. Fellowship of Christian Athletes is an important organization to Francoeur. They allowed him to meet Jesus and led him to choose a life that honors God. Now he frequently shares his story for others to hear at FCA camps and banquets. If you would like more information about this great organization and all that they are doing, check out their website here. Sharing the story of what God is doing in your life is a great way to draw others to know Him, it will also help you build your faith because when you intentionally look at your story, you see how God is working – maybe in ways you haven’t realized before. And being aware of God at work will spark you to keep telling others about Him. Francoeur finished a recent talk at an FCA banquet with a quote from legendary NCAA basketball coach John Wooden. It is challenging and a good question to keep on our radar. Wooden said “If I am ever arrested for being a Christian, I hope that there is enough evidence to convict me.” I pray that God will help me be more aware of all He is doing, so when I see it, I will not be able to stay silent, but that I will leave enough evidence to be guilty of being an outspoken Christian. Play Ball Justin Masterson and J.R.Towles! This is the 8th installment in my Play Ball series about Christ-following professional baseball players. I’ve been doing 2 teams every post and am planning to hit all 30 teams as the season goes on. The Indians have not been very good for many years. When a team isn’t competitive for over a decade, they usually wind up trading their star players at the July trading deadline because teams will offer young talent for established stars who can help take a shot at the World Series. As a fan, It can be frustrating to see names like Casey Blake, Victor Martinez, C.C. Sabathia and Cliff Lee, leave in exchange for unknown young players. The hope is that those unknown players will develop into stars down the road, living up to the potential they were thought to have. That is what is starting to happen in Cleveland these days. Carlos Santana, Shin-Soo Choo, Michael Brantley, Matt LaPorta and Justin Masterson all came in trades for established stars, and so far this year, they have helped the Indians to first place in the AL Central Division – and they are young enough to offer hope for a few years to come. I’ve heard some opposition to this approach to sharing your faith. People will say that “when necessary, use words” offers a cop out for those that don’t want to actually discuss their faith. I believe that there is a more important aspect to focus on. It is another common saying – “Actions speak louder than words” What we say is meaningless if it doesn’t match up with how we are living our life. In Justin’s case, his actions are speaking loudly. 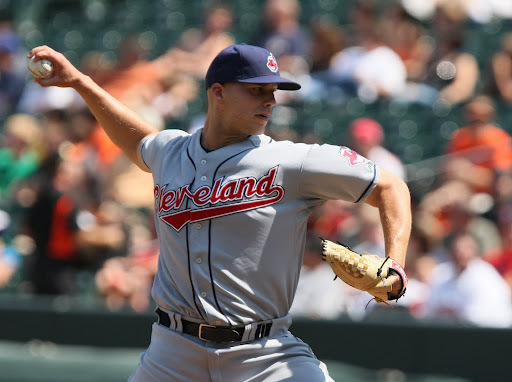 I read several articles about Justin Masterson, and each one talks about how likable he is; how humble he is; how friendly to teammates and fans he is. By being known as a nice , humble guy he is earning the right to be heard. He actions are speaking loudly, and they give his mouth a chance to tell why he lives the way that he does – to glorify God! If you want to learn more about Justin, you can read this article here from believe.com. In the article, we also learn of his support for Invisible Children. This is an organization that is drawing attention to the way children are being used in the Civil War that has been raging in Uganda for over 20 years. Invisible Children is made up of a group of artists, filmmakers and other concerned people who are looking to use their talents in the arts to draw attention of the world to the war in Uganda and challenging them to act to resolve the conflict and end the war. And I will also send some advertising to Justin’s wife. 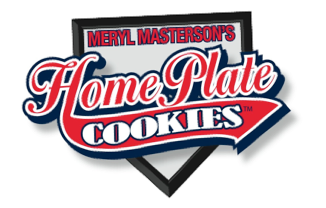 Meryl Masterson has started her own business, baking cookies and selling them online. You can check it out online at Meryl’s Cookies. They sure look and sound yummy! I’ll have to check them out sometime soon! And now, we head south to Houston to talk about catchers. I found an article about J.R. Towles. He is in his first full season with the Astros, after a couple tastes of the big leagues over the past 2 years. Read an interview with him by Prodigal Magazine here. 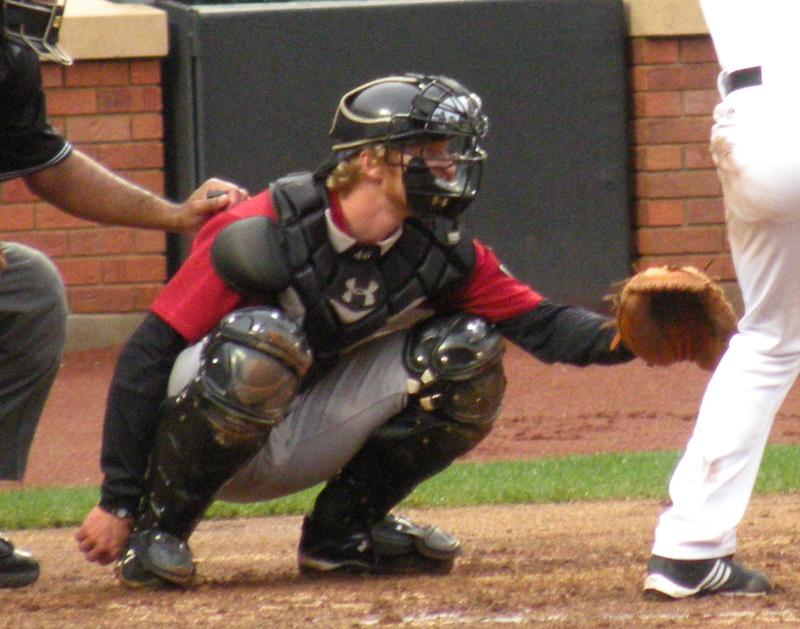 Reading this interview got me thinking about catchers and their role. Like the article says, they call the shots, they make decisions, like what pitch should come next, and where should it be targeted. They help set the pitcher up for success, but to do so, they have a lot of work to do. They need to study, they need to know the opponent and they need to make sure they are prepared to deal with whatever the opponent sends at them. There is a good analogy for our Christian walk in this. As Christ-followers, we need to know our enemy. We need to know that he is going to be relentless in trying to get us to fail. He will always send his best, trying to do damage, exploit any mistake that we may make, and defeat us. Part of a catcher’s job is to know the batter, know his tendencies, know where and how he can do the most damage and game plan with the pitcher to avoid those damaging areas. This requires study, taking advice from others who have a different or deeper perspective, and constantly being aware of all that is going on around them. We know that it is God who calls the shots, but he asks us to be obedient to him, and to be prepared. When we withstand one attack, there is bound to be another one waiting in the on-deck circle. Let us be students, teachable, and diligent in our preparation, so that we can face the enemy and know that through Christ, we can be more than conquerors. Let us study our Bible, so we can be aware of all that the enemy wants to do, and how to stand against it. As a Red Sox fan, I have had opportunity to enjoy cheering for a successful team. And it is fun most of the time. But I have a confession to make. There is something about teams that are not successful that create a soft spot in my heart. I want to see them be successful. That is why I was a Montreal Expos fan for so many years. And that is why if you were to ask me what my favorite National League team is, I would mutter under my breath that it is the Pittsburgh Pirates. I don’t have any real reason why that is. I just am drawn to them. So there, I’ve admitted it, now let the laughter begin! Actually, one of the reasons is that I really like the city of Pittsburgh. Coming in from the West, through the tunnel carved in the mountain, to the downtown that rests on the 3 rivers is a truly spectacular view. I have not spent much time there, but what I have spent there I’ve really enjoyed. So for my favorite NL team, in one of my absolute favorite cities in this country, here is part 7 in my series about Christ-following baseball players. We will look at the story of the Pirates starting center fielder. He was the team MVP in 2009, the same year he finished 4th in NL Rookie of the Year voting. Now in his third season, he continues to make a name for himself as a cornerstone on a young team. And while the team is not considered an elite team by any stretch, with a core of young players like Andrew McCutchen, their day may not be too far away. And Andrew McCutchen’s strong belief if God makes me want to cheer all the more for him and his team. Read his story in his own words in this article from Fellowship of Christian Athletes. What stands out to me about his story is that he desires to be an example to kids and peers alike. Since people know of his faith, he challenges himself to keep his emotions in check, not getting angry at umpires or whatever, but choosing instead to refocus on the task at hand and how to best help his team. He has made his faith in God known, and he knows that whatever he does – good or bad – will be noticed, and identified with him as a Christian. I, for one, wish I had learned that lesson earlier, and followed it more closely in my life. I know that when I played baseball, I would get angry others (bad call by an ump) or at myself (for an error) and it would get the best of me. Still today, it is easy to get distracted by things that we cannot control. I know I need to remind myself (or be reminded) to step back, refocus and keep working toward the task at hand. And, this weekend is Mother’s Day. I very fondly remember a year ago, when Dallas Braden, of the Oakland A’s threw a perfect game on Mother’s Day and captured the attention of the sporting community. It was an incredible scene considering that he lost his mom pretty young, and was raised by his grandmother, who was on hand for the game. I was cheering him on for those final few outs. It was a day to remember. With Mother’s Day approaching, I thought I would also share a story about a member of my current hometown team – Denard Span He and his older brother were raised by a single mom, who, as you can read in this story from Sharing the Victory Magazine, made great sacrifices to get her boys to school, practice, games and church. I played sports when I was younger, and I know the busy schedules that sports teams keep. Game and practice schedules can keep everyone busy – even parents. So, to keep on top of it as a single mom is a tribute to her desire for Denard to accomplish all that his God-given talent would allow him to accomplish. And now, as the Twins starting center fielder, he knows that he is where he is largely because of the sacrifices that she made. He also knows that his relationship with God (that she helped instill the importance of) continues to guide his decisions and carry him through hard times (like injury and disappointment). He is a favorite here in the Twin Cities, Thank you to his mom, Wanda, for supporting him and sacrificing so he could excel. Happy Mother’s Day to you! And a Happy Mother’s Day to the special mothers in my life, too. My beautiful wife – the mother of my wonderful daughters. Check out all she has going on at www.sharingthepagesoflife.com. And Love and Happy Mother’s Day wishes to my mom, Nellie, in New Brunswick, Canada and to Sherrill, my mother-in-law here in the Twin Cities. Play Ball Micah Owings and Reggie Willits! We will take a bus ride to the minor leagues this week for our 6th installment in the Play Ball series – my look at some professional baseball players who are living out their faith in the huge, bright spotlight of professional sports. Our stories today will talk about Reggie Willits and the trials of baseball life on the bubble, moving between the majors and the minors and the challenges that life as a baseball player can put on a marriage and a family. We will look at Micah Owings, and a change that he was asked to make and some great organizations that his family members have started. First up, to the Arizona Diamondbacks organization and Micah Owings. Micah has been up and down between the minors and majors for the past 4 years. He is a pitcher by position, but is most known for his bat – unusual for a pitcher. He has been used as a pinch hitter, and even won a Silver Slugger award in 2007 given to the best hitter at each position in the league. (.333avg, 4 home runs) His bat is so feared, that the Diamondbacks have tossed around the idea of turning him into a first baseman, so they can get his potent bat in the lineup more often. Well see what happens this year. He is currently playing for the Reno Aces (AAA minor league team). Read an article about his proficiency in the minors and his well known bat by clicking here. Also of interest about Micah Owings, is his family, the various successes that they have had, and how they are using their success to tell others about Jesus. Check out an article about the family by reading this article: A family’s love furthers the Christian cause from the Gainesville Times. or click on the picture to the left to visit Micah’s website, to read his blog and connect to the organizations that his family work with. Check out these Owings family organizations, too. And to the American League, Reggie Willits is an outfielder in the Los Angeles Angels organization. Just this week, he was demoted to Salt Lake City, to play with the Bees. This move and transition is nothing new for Reggie and his family. They have been through a lot of transitions already. Reggie and Amber were childhood friends, and eventually High School Sweethearts. They got married in 2001. But baseball brought some challenges, Amber worked in Oklahoma, Reggie was playing out west, and they – like lots of young baseball couples – were spending large portions of time apart. It wasn’t until 2007, that they were able to bring their family together on a more permanent basis. Throughout this time, and even now as travel and going between majors and minors creates struggles, they have decided to make sure that their priorities are all lined up correctly – God, family and then baseball. God promises this in Matthew 6. If we seek the Kingdom of God, and live to honor Him, He will work out the rest of the details. Read the whole story on the Willits family in the article Faith in God, trust contribute to major league relationship. As I consider the challenges that would come from being away from my wife for extended period of time, I can appreciate all that Reggie and his wife had to do to make it work until they could be reunited in the same time zone. The challenges that come up, no matter what the circumstances should always work to draw us closer to God. Leaning on His help can guide us through whatever obstacle there is. I appreciate the Willits story and wish them the best in going forward, where ever their path leads them. A good, healthy, God-centered marriage can be such a witness and a demonstration of love and commitment. As they stay focused on Him, I believe God will use them to impact the lives around them. And because I am such a trivia buff. Here are a couple of extra tidbits about these 2 men. Reggie Willits is named after former baseball hall of famer (and Angel outfielder) Reggie Jackson) and through a great chain of events, the Willett’s decided to name their first son what??? Jaxon! Cool huh! And, earlier in this series, I blogged about Matt Tuiasosopo. (check it out here) Well, Matt will get married this summer to…….. Micah Owing’s sister Abi. It’s a small world after all! Well, it is draft day in the NFL and it is kind of a funny one. The NFL is in the midst of a labor issue, and so the feeling around NFL draft day doesn’t bring the same level of excitement that it normally does. It is still grabbing a lot of attention because it is fun to think/talk/debate something in the NFL other than the off-the-field battle that the league and it’s players are fighting through. One thing I’ll be watching with interest is to see where Prince Amukamara, the excellent DB from the Nebraska Cornhuskers, will be plying his trade at a professional level. He is vocal about his faith, and I am excited to see how God will use him as a pro and with all the opportunities he will have to shine his light at in the pro football world. Prince Amukamara is an actual prince in the tribal village his family is from in Nigeria. He is also a child of the King of Kings. But it is his humility that speaks a lot about his character. He came to Nebraska expecting to be a running back. The coaches almost immediately wanted to change his position to defensive back. It isn’t easy to change all that you have been doing and take on a new position, but he was willing to make the change. He was willing to accept the coaches desires, and be coachable to be the best he could be. There is a lesson in that for us to. Sometimes it involves being corrected in our behavior, sometimes it is about our unseen potential. The coach saw something amazing in Prince, and gave him a choice. He was willing to work hard and make the adjustments for the good of the team and for the opportunity to be the best player he could be. Read the Nebraska FCA article here. When God wants to change something in our lives, we have a choice to make. He may move us into a new situation that we weren’t expecting and it may even be uncomfortable. What will we do? Resist it? Walk away from it? or trust that He has an amazing plan in place, and just needs us to be obedient. Prince Amukamara faced a decision in college, and he trusted his coaches, changed his position and tonight, he will be a first round draft pick in the NFL. Don’t miss the fact that he had to work and work to develop into the player he is now, even after the change, but also see that he was willing to trust his coaches and make this change, and it is paying off big time (figuratively, and literally). Prince, I am cheering you on as you step into this next stage of life. Keep being humble, coachable and focussed on the coaching of the King of Kings.